Just inside the west entrance to Capitol Reef along UT 24, the Chimney Rock Trail is perhaps the best short path in the national park, as it is relatively short, not too steep, provides the shortest hike to a high elevation viewpoint, and passes varied surroundings; besides Chimney Rock itself, an eroded pillar of red sandstone, the trail encounters colorful badlands, tall cliffs, and the mouth of a narrow canyon. Another trail leads down this ravine and meets the much longer Spring Canyon, which can be followed for many miles either up or downstream, though the majority of visitors just come for the main Chimney Rock loop, a journey of 3.5 miles and 580 feet elevation gain, which can be done in about 90 minutes. 11 views of the Chimney Rock Trail. Panorama from the top of Mummy Cliff. The trailhead is by a parking area with rest rooms, just off UT 24 - part of quite a busy stretch of the highway. A second trail (unmaintained) starts just opposite, heading down a side canyon of Sulphur Creek and forming the first part of a 6 mile route along the creek, eventually emerging at the national park visitor center. 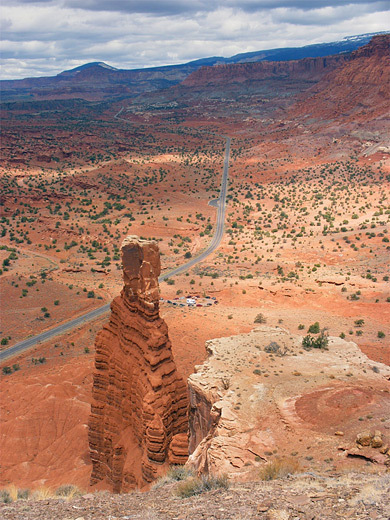 Half a mile east of the trailhead, a short side road leads to Panorama Point for good a perspective of the landscape, including Chimney Rock, the high Wingate sandstone cliffs that border UT 24, and of the flatter, ledgy ground to the south. 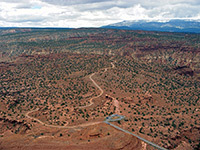 This road continues (unpaved) to an overlook of the Goosenecks of Sulphur Creek, and a footpath to another summit (Sunset Point). Yet another good photograph location in the area is found 0.8 miles further east, at a pull out along the highway in the middle of an open area (Whiskey Flat), beneath taller and even more colorful cliffs. 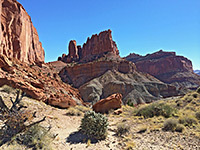 A whole day could be spent exploring this area, and all before reaching the main visitor area a few miles away along Capitol Reef. The path first crosses sandy ground then winds through undulating mounds of the Chinle formation, colored in various muted shades of purple, red and brown. A short but quite steep ascent of nearly 300 feet reaches a junction at the edge of a plateau, at the start of the loop section, for which anticlockwise is the recommended direction; turning right, the trail climbs as much again, always staying quite close to the edge of the mesa and the vertical drop off beyond (Mummy Cliff). Chimney Rock is the westernmost tip of the cliff, actually the end of a narrow ridge extending away from the main plateau, and formed of many thin strata of the Moenkopi layer. On top is a layer of harder Shinarump caprock, delaying further erosion of the softer rock below. The path has several good viewpoints of the rock before moving out of sight to the east, along the top of Mummy Cliff and up to a flat summit at 6,634 feet. This has very wide ranging views over several miles of UT 24, from Holt Draw near Torrey in the west across to Fruita in the east, then south over much rugged red rock land towards the often snow-capped Boulder Mountain, 20 miles distant. The path starts to descend after this high point, passing beneath a secondary summit (see 360 degree panorama) and on to another good overlook, of badlands and eroded rocks to the east, at the edge of Whiskey Flat, beneath streaked red Wingate sandstone cliffs. 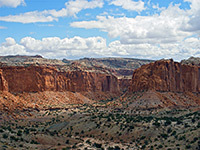 The next stretch has several short climbs and descents, before a drop into the upper end of Chimney Rock Canyon, the tributary of Spring Canyon - this is a typical Capitol Reef drainage containing jumbled, multicolored boulders, framed by jagged, broken strata near the streambed and smoother, vertical walls above. The return route east is along the base of more tall cliffs forming the edge of Meeks Mesa, as the path rises gently back to the junction, from where the trailhead is a ten minute walk down the hillside.